A major theme of MLH has been simplifying. When we simplify we make room for the most important things in life. Discarding physical clutter helps us psychologically, but so can other kinds of simplification. We can simplify our finances, relationships, expectations, events, meetings, organizations, and more. All of this, when combined with priorities founded in the gospel, is healthy and positive, and will free us up to be more Christ-like people. So you can imagine my excitement when I stumbled across a talk given by Elder Lynn G. Robbins of the Presidency of the Seventy, on that very topic. Elder Robbins was one of the founders of Franklin Quest (later Franklin Covey), which was huge in it’s day. While I have no idea what his net worth looks like today, my guess is that he has plenty of money to buy whatever he wants. 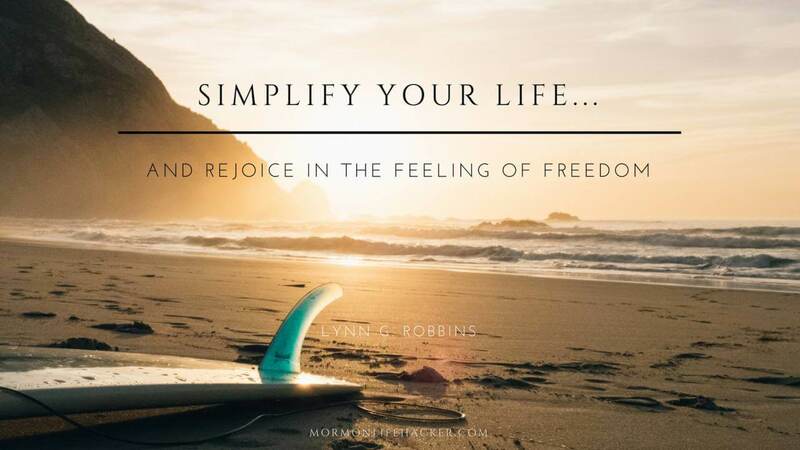 Yet his message to the North America Southwest Area this past November, was all about simplifying our lives: from apps and games, to TV shows, to closets, to mortgages, he encourages us to follow the Savior’s example by simplifying our lives. In keeping with our new Instagram and Pinterest accounts, I turned some of my favorite quotes into pinnable images and added them to the talk. Make sure to follow MLH on those channels and reshare these great quotes! In the comments, let us know your favorite parts and what ways you’re resolving to do better. Never in the history of the world have the children of God been faced with so many options that compete for our time, attention, and other resources. Our options for entertainment, clothing, sporting activities, TV programming, video games, music lessons, cable channels, YouTube videos, iTune songs, connections through social media, education, etc., etc. is enough to make one’s head spin. We not only have more options to choose from than any previous generation, but the options are more accessible, often at the touch of a button or an app. Some modern inventions and options have actually simplified life, like in-door plumbing and electricity and modern appliances. In those respects life is much easier and simpler than past centuries. But the 21st century with its gazillion options has also made this century the most complex; the easiest of times and yet the most complex of times. Perhaps never in the history of the world has living in the world, but not of the world, been such a difficult equation to balance. Some heavenly calculus is needed to help us deal wisely with good, better and best to quote Elder Oaks. I have chosen to spend these few minutes with you on the Christlike virtue of simplicity, the wisdom of pursuing it, and the freedom and joy that result from it. Simplifying our lives, increases the probability of achieving the most important things in life—the best things. Nephi said, “My soul delighteth in plainness” (2 Ne. 25:4). While Nephi was referring to keeping writing simple, the virtue of simplicity is also the judicious use of resources to avoid cluttering life. One who has mastered the virtue of simplicity defends the best things in life from the intrusion of too many good, but unnecessary things. Elder Oaks cited the Savior who taught Mary and Martha this principle and the need to correctly prioritize, “But one thing is needful: and Mary hath chosen that good part” (Luke 10:42). 1st Joseph Smith was able to condense and simplify the beliefs of the church in the concise and doctrinally profound Articles of Faith that fit on the backside of a business card. That’s an incredible example of the virtue of simplicity. 2nd If you had to come up with a Church-wide program to retain all new converts, do you think you could have kept it to one sentence as President Gordon B. Hinckley did – a friend, a responsibility, and being nurtured with the good word of God? That was a stroke of genius, and of uncommon wisdom and inspiration, and an amazing example of the power of simplicity. 3rd Simplicity was one of the wise principles that guided the First Presidency and Twelve in their drafting of “The Family—A Proclamation to the World” and “The Living Christ” documents that were kept to just one page. Wow! 4th It is in great part the simplicity of the Gettysburg address that has made it so famous, admired and quoted. On these two commandments hang all the law and the prophets. (Matt. 22:37-40). An unparalleled example—and awe inspiring. How’s that for a one-sentence sermon!! By recognizing the inherent power and wisdom of the virtue of simplicity, we understand why these examples just cited have had such an impact in our lives. And see that all these things are done in wisdom and order; for it is not requisite that a man [or woman] should run faster than he [or she] has strength… (Mosiah 4:26-27). the truth may just seem too straightforward, too plain, and too simple for us to fully appreciate its great value. So we set aside what we have experienced and know to be true in pursuit of more mysterious or complicated information. Hopefully we will learn that when we chase after shadows, we are pursuing matters that have little substance and value… are we making our discipleship too complicated? Paul warned the Corinthians, not to become “corrupted from the simplicity that is in Christ” (2 Cor. 11:3). In the Book of Mormon, Jacob noted that the Jews “despised the words of plainness, and sought for things that they could not understand. . . looking beyond the mark.” (Jacob 4:14). Wandering Israel couldn’t accept the simpleness of the brazen serpent, and there “were many who perished.” (1 Nephi 17:41). To local leaders—be very careful in giving more than one calling, plus home or visiting teaching, to valiant members. Don’t risk having your functional families become part of the ranks of the dysfunctional by overloading them with too many callings. One of life’s ironic paradoxes is that simplicity seems so difficult to achieve. Why is it so easy to get into fixes, for example, and so hard to get out of them? 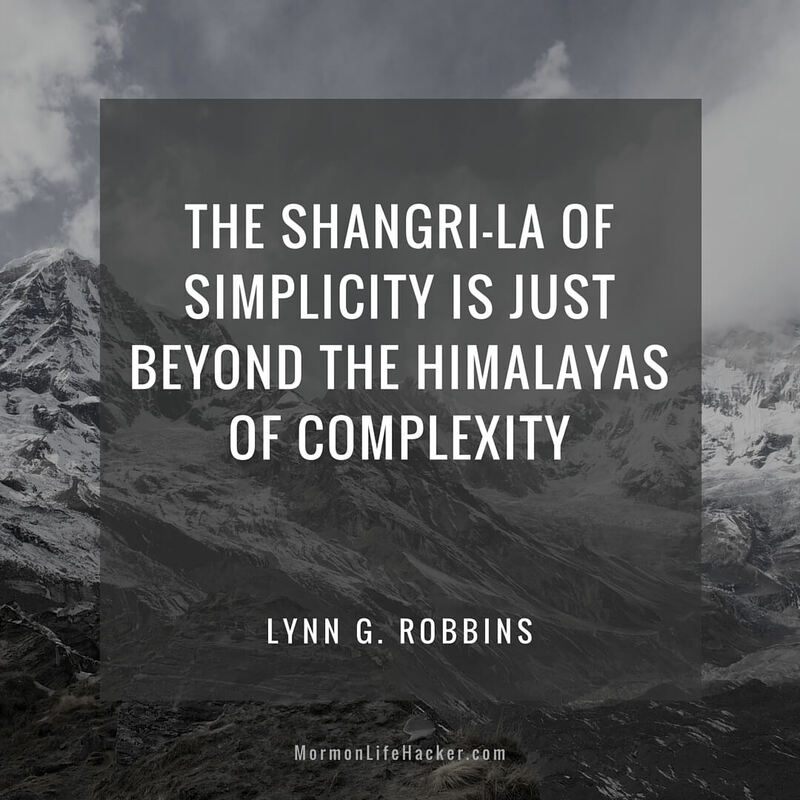 Leonardo da Vinci said, “Simplicity is the ultimate sophistication.”9 Wise people eventually make that discovery; that the Shangri-La of simplicity is just beyond the Himalayas of complexity. All Christlike virtues are gifts of the Spirit and require great effort, prayer and heaven’s help to develop. Simplicity is a Christlike virtue and takes other gifts of the Spirit to develop—a great deal of wisdom, prudence and self-restraint, for example. And the cares of this world, and the deceitfulness of riches, and the lusts of other things entering in, choke the word, and it becometh unfruitful (Mark 4:19). It’s those “other things” in this verse that begin to clutter our life and decrease our joy and the effectiveness of our most important roles—husband and wife, father and mother, brothers and sisters, and our callings. Because many of you listening today are over-achievers, (not a bad thing), you will be tempted with too many other things or choices, and attempt to do too much, and over-extend yourselves. Too many “other things” or choices also bog down the decision-making process by introducing unnecessary confusion and making optimal decisions less likely. It is usually the simplest of viable options that works best. The Lord was concerned that His apostles were too busy, giving them this counsel on making time for rest and relaxation. 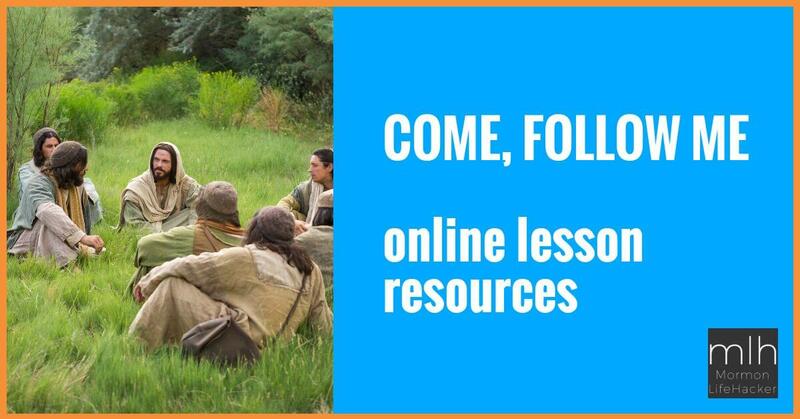 “And he said unto them (meaning the apostles), Come ye yourselves apart into a desert place, and rest a while: for there were many coming and going, and they had no leisure so much as to eat.” (Mark 6:31). I’m sure that many of us can relate. Speaking of leisure, we certainly hope that you husbands are keeping your lives simple enough to take your wives out on regular dates. It might be wise to let your wives define what the word “regular,” as well as the word “date” mean. Simplifying our lives begins at home. In a Research Information Division study on challenges to holding family home evening the foremost challenge in the survey was time conflicts with the family schedule. The family was simply too busy, with 45% of respondents using that as their #1 excuse. If we are too busy for family, an alarm should go off in our minds telling us that good things are undermining the best. In a study cited in the book Your Money or Your Life the authors published a study and happiness index or graph illustrating that happiness begins to actually decrease at a certain point of excess spending. In part it is because life simply becomes too complex—too cluttered—not simple enough. Understanding, “What is sufficient for our needs?” is a powerful example of the virtue of simplicity and its inherent joy. When we over-purchase we risk being “time-consumed” with too many things of this world. One antonym for complexity, and perhaps the antidote to it, is contentment. The Apostle Paul stated, “I have learned, in whatsoever state I am, therewith to be content” (Philip. 4:11). Contentment and gratitude are also Christlike attributes for one to achieve simplicity and happiness. For Franklin, “outward show” was dangerous. He said: “The eyes of other people are the eyes that ruin us. If all but myself were blind, I should want neither fine clothes, fine houses, nor fine furniture.”14 He knew that time is the one thing that is purchased by not spending money. With more time, he was available for the Lord to use in helping to establish a free land where the gospel could be restored (see D&C 101:80). Franklin didn’t need his own library like James Logan; he started the first public library and had access to the same thousands of books without the burden of ownership. Of course, the Savior Himself is the greatest example of proper prioritizing. With few possessions to distract Him, He focused all of His time and effort on His mission. 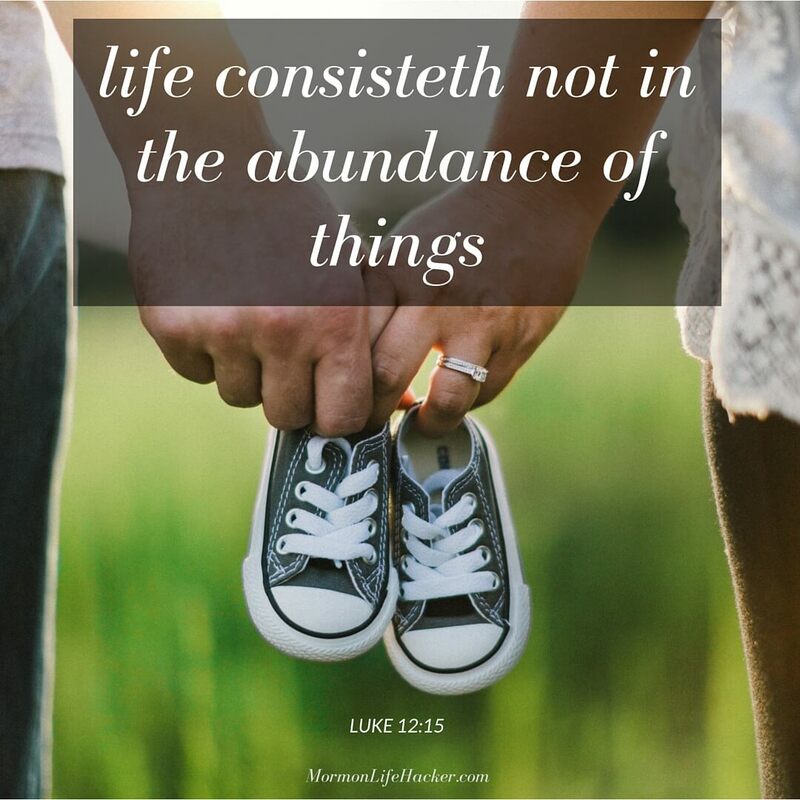 The Lord doesn’t expect us to seek out poverty, but His counsel is direct: “Thou shalt lay aside the things of this world, and seek for the things of a better” (D&C 25:10) and “A man’s life consisteth not in the abundance of the things which he possesseth” (Luke 12:15). One thing I did years ago that simplified my life was plastic surgery—or cutting up many of my credit cards. See how thin my wallet is now—I have found that I don’t need many credit cards, and that’s also simplified the correspondence I receive from the sponsoring institutions. Fewer credit cards also eliminates the temptation to use them in spending beyond our means. Simplifying by de-cluttering is usually a good idea for our closets at home. Home economists estimate that 1/3 of the clothing in our closets, is never worn. Many of you, like me, may be hoping to fit back into them one day. Perhaps we should hold a garage sale instead, or even better donate that excess clothing to Deseret Industries where it can be purchased and used by someone who they might actually fit. Remember that hoarding is an antonym of simplifying, so go home and pick a closet— and start to declutter. See if it doesn’t make you feel better. What apps will you remove from your mobile phone today that will simplify your life, especially if you’ve been tempted to access that app during sacrament meeting, or even during this talk? Maybe you could start with solitaire if that’s your time waster. What TV program can you sacrifice that you have been addicted to that really isn’t improving your life? What video game can you give up that may be hurting you far more than helping you. Are you living in a bigger house than you really need? Would selling the house, and dramatically reducing your mortgage cause you to breathe easier and give you a new sense of freedom and peace of conscience? These kinds of questions would certainly be worthy of a family council and pray about ways your family can simplify. 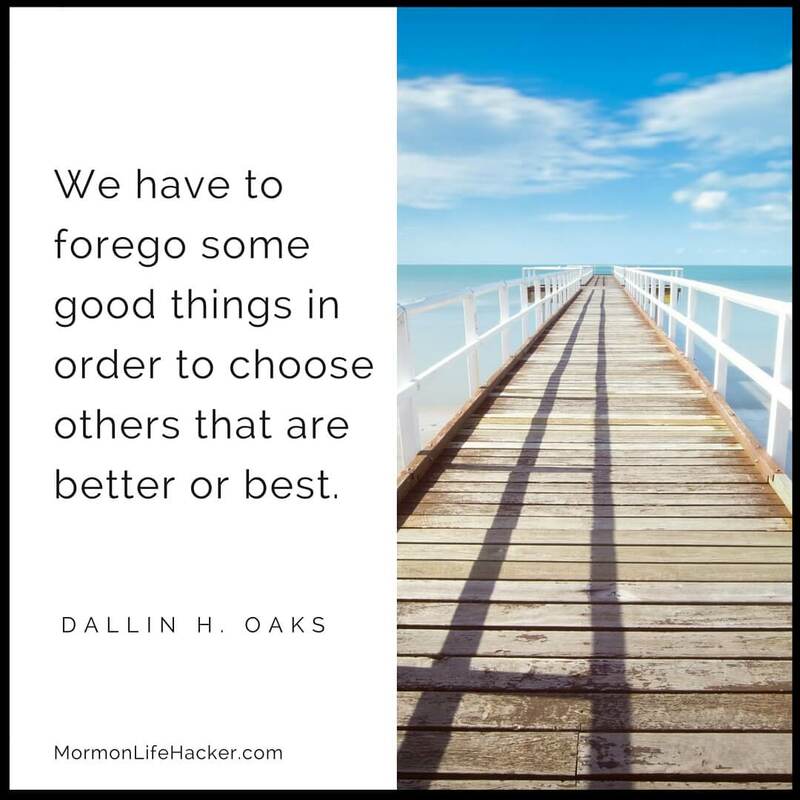 In that family council it would be helpful to log onto LDS.org and re-read Elder Oaks’ classic talk, Good, Better, Best. It will inspire you in your efforts to simplify and focus on those things of greatest meaning and impact. Developing the Christ-like virtue of simplicity can ease burdens, bring peace and lead to greater joy. It is certainly a Christ-like virtue worth pursuing, I so testify in the name of Jesus Christ, amen. So glad you were able to get a copy of this talk. I asked my stake for a copy after it was given and they said it was not available. You rock. This was a groundbreaking talk on the topic . It’s a shame the church won’t make the regional talks more readily available!